Cara Burrows had booked a very expensive holiday to disconnect from her family and to take a very important decision that will change all of their life... But in some twist of fate, she discovers that she may have seen a dead girl and it seems that her life could be in danger... now she just wants to return home! '"Once the tiniest doubt creeps in, you start to wonder about everything. The Melody case is not easy to explain, but between the interviews Cara watch online and the research she makes in the resort, we discover all the dirty secrets about the case. Melody disappeared, but her parents are in prison for her death, even if her body was never found... so what had Cara seen a ghost or the real Melody? Of course, I will not tell you the answer, the book is worth the reading and discover the truth! And as maybe you can imagine, the case was closed, but there are still people that don't want the truth going out, and that puts Cara's life in danger! I like that in Sophie Hannah books everything is connected, there are no missing links, everything fits in the end, that makes her books different, but at the same time great! She is the queen of the psychological thrillers, there's no doubt about it. 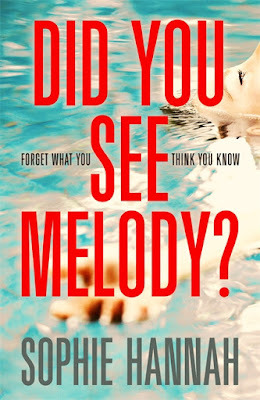 Did You See Melody is a book that will make you re-think about justice and about how much the press can influence on the case, making a person guilty or innocent depending on who talks about it and how good your mood is when you talk to the press. This is a psychological thriller where the truth maybe will never go out... Did You See Melody?